^ 1.00 1.01 1.02 1.03 1.04 1.05 1.06 1.07 1.08 1.09 1.10 Founding members drafted the ESA charter which entered into force on 30 October 1980. ^ Ireland is considered an initial signatory, but since it was a member of neither ESRO nor ELDO（the precursor organizations to ESA）the Convention entered into force when the last of the other 10 founders ratified it. 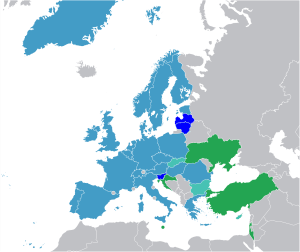 ^ 3.0 3.1 3.2 3.3 3.4 3.5 3.6 Acceded members became ESA member states upon signing an accession agreement. ^ ESA Budget for 2013. esa.int. 24 January 2013. ^ Convention for the establishment of a European Space Agency (PDF). ESA. 2003 [29 December 2008]. （原始内容 (PDF)存档于2009年7月6日）. ^ ESA programmes with Czech participation (PDF). Czech Space Office. 2009. （原始内容 (PDF)存档于2013-05-11）. ^ ESA Convention (PDF) 6th. European Space Agency. September 2005. ISBN 92-9092-397-0. ^ Poncelet, Jean-Pol; Fonseca-Colomb, Anabela; Grilli, Guilio. Enlarging ESA? After the Accession of Luxembourg and Greece (PDF). ESA Bulletin. November 2004, (120): 48–53. ^ 8.0 8.1 Leclerc, G.; Lessard, S. Canada and ESA: 20 Years of Cooperation (PDF). ESA Bulletin. November 1998, (96). ISBN 92-9092-533-7. ^ Dotto, Lydia. Canada and The European Space Agency: Three Decades of Cooperation (PDF). European Space Agency. May 2002.